The Victory-1 well will be drilling for around 34 days with periodic news expected to flow (hopefully like oil, for REY). The well is targeting what Buru estimates is an unrisked gross potential of between 7 million barrels of oil and 98 million barrels, with a mean estimate of 40 million barrels – note that these are total illustrative probabilistic volumetric estimates (unrisked). You can read the full details here . 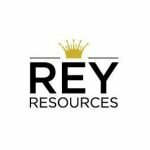 REY has a 25% stake in this well, and is contributing 16.7% towards well costs. Buru and Mitsubishi have a 37.5% stake each. 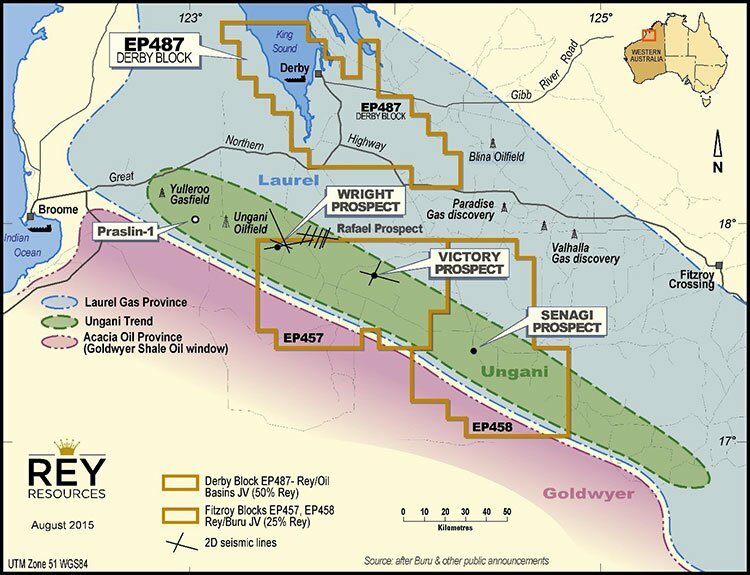 Victory-1 is being drilled on the Ungani Trend, home to Buru’s company-changing Ungani discovery, the same discovery it is currently producing from. Buru is currently producing 1,250 barrels of oil per day from the Ungani discovery, and is hoping to ramp up that production into the future by making more oil discoveries in the region – and hopefully this starts with REY’s Victory-1 well. A few weeks ago, Buru hit a 23m oil column at Praslin-1, also on the Ungani Trend, giving REY further confidence that a repeat performance at Victory-1 could be on the cards. After all, the wells are targeted to essentially pierce the same rocks. 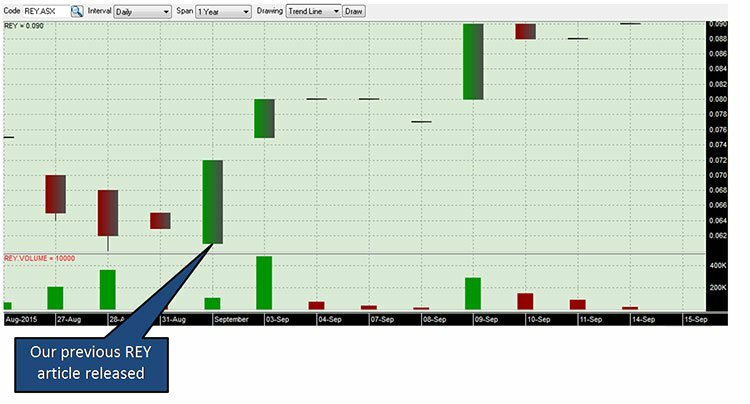 After the Victory-1 well, there is more to look forward to for REY investors – a different drill rig will move straight to a shallower target at Senagi – where once again, REY have a 25% equity stake. There is little certainty in oil drilling, and success is by no means guaranteed. However, with one well spudded and one to come next month, the next two months could just be company-making for REY. 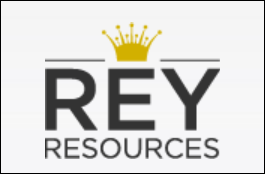 We have been following Rey Resources (ASX:REY) for the last few years, tracking their progress as they gained strategic positions in key WA oil and gas basins – but the time is really now for REY. With about 34 days until preliminary results are released for Victory-1 (will still need to be logged and, if successful, flow tested), and one more well to be spudded, this may be just the beginning for REY. Let’s explore in more detail the potential these wells hold. To know why we’re following REY closely, you need to get a touch more background on the Canning Basin as a whole. 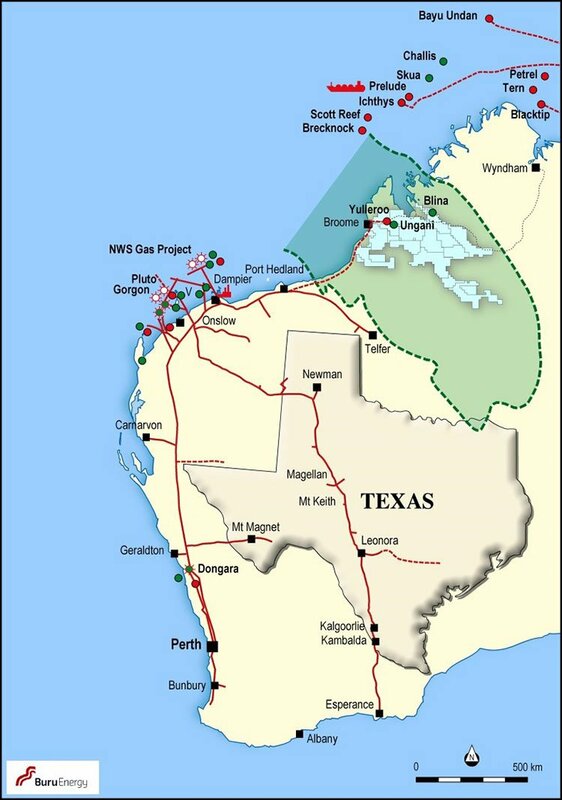 Situated in the WA outback, the basin has been called one of the most prospective unconventional petroleum basins in the world and has the potential to diversify WA domestic petroleum supply away from the LNG players on the North West shelf. That’s why WA Premier Colin Barnett has spoken so positively about it in the past, and having a resource-friendly premier is always a good sign. The US Energy Information Agency has estimated that the entire basin has a risked recoverable resource of a whopping 235 trillion cubic feet of gas. To put that into perspective, the LNG plants under construction in Queensland at the moment have a combined processing target of 1.13 trillion cubic feet of gas per annum . Oh, and the Canning Basin is roughly the size of Texas. Nobody’s suggesting that REY has its foot on LNG-ready quantities of gas, but it’s not in a bad neighbourhood to explore. At the moment the early commercialisation play from Buru is to pursue conventional oil, which is easier to commercialise than onshore gas – and then use the cashflow and profits to chase the unconventional potential of the basin. After all, putting oil on a truck is easier than building pipelines, although it’s only 6-700 kilometres to connect with the network to the domestic market. It also fits into a thesis of the basin being a long term game. But how to actually make money in the basin? Buru has a model in place which is underpinned by its Ungani oil production facility, which is currently pumping out 1,250 barrels of oil per day but could go as high as 3,000 bopd. Ungani is effectively unlocking the basins potential for Buru – it can provide a cashflow as well as an understanding of the target style and technical/ operating knowhow. This year’s current drilling program along the Ungani Trend is aimed at grabbing more oil for its production. It’s a smart play, but there’s more than one way to skin a cat. Enter REY, which is playing its part in bringing up more oil from the Ungani Trend with two key wells to be drilled with Buru, one spudded this week, and the other nearby, which is also promising to be a much more straight-forward affair. The Victory-1 well is being drilled as you read this into the Victory prospect, which is a large regional high in a similar setting to Ungani. It’s wildcat well, but it’s on the existing Ungani oil trend – a fairly good place to start. At the same time, there is absolutely no certainty in life and even less so in oil drilling, so success is no guarantee here. The well will go through both Laurel carbonate which is the Ungani-style target and the lower Nullara carbonate. The immediate aim will be to hit conventional oil, but wireline logging could bring back all sorts of interesting information about the Laurel and Nullara which could inform longer-term plans. REY has a 25% interest in the well. The well should take 34 days to drill down to the planned target depth of 2,600m, with the well then being cased and suspended for (hopefully) future production testing and ultimately production. The Senagi target is a bit more of a straight-forward oil target but no less prospective. It will be drilled to a shallower (less than 800-1200m) targets, which means the drilling will cost the joint venture less, and is positioned close to an old mineral bore hole. Back in the day, the Camelgooda-1 well was drilled within what is now EP458 but it wasn’t looking for oil. It hit oil anyway, but given the company involved wasn’t an oil company, it moved on. The well essentially hit what looks like an Ungani Dolomite reservoir equivalent with about 6m of oil shows in the core, throwing up the strong prospect that it could be sitting on an oil resource. Senagi-1 is slated for drilling next month using a different rig: DDH1 #31. Remember, for both wells REY has a 25% stake, but is only contributing 16.7% toward well costs. Buru is acting as operator on the wells, meaning that REY has managed to keep its exploration costs to a minimum through its part free carry while gaining the benefit of the most experienced Canning Basin operator. REY not only has the two upcoming wells on the slate, but also has interested in EP487 to the north (what is called the ‘Derby Block’) and a permit down in the Perth Basin, another hydrocarbon province generating a bit of buzz around recent gas discoveries. However, we wanted to run you through the upcoming drilling program. While oil and gas companies love talking about seismic, wireline logging, aeromagnetic surveys and all the boring stuff, the oil and gas investor loves to see drilling. For a company with a market cap of around $64 million (at the time of writing), it has pulled off a savvy move by teaming up with Buru, which has a market cap of over $120 million. Both companies are in different stages of their development, with Buru looking to ramp up production and REY just starting out on its journey as a Canning Basin player. The next two wells in the program could tell investors a lot about what sort of potential REY has. It’s looking for shorter term oil production while possibly firming up longer-term plays. The world of speculative oil stocks is high risk – and there are no guarantees of success. In any case, we will be watching REY with interest over the coming months.